Piggy banks love cash. But what do you do if Grandma gives your child a check? That cute little piggy bank is clueless and you have to come to the rescue. Piggy banks don’t cash checks. Because your child can’t spend a check, you have several options for giving your child cash. Give your kid the cash from your pocket. Deposit the check later. Deposit the check remotely using your smart phone. Give cash to child from your pocket. Drive to the bank and cash the check in person. Give cash to the child. 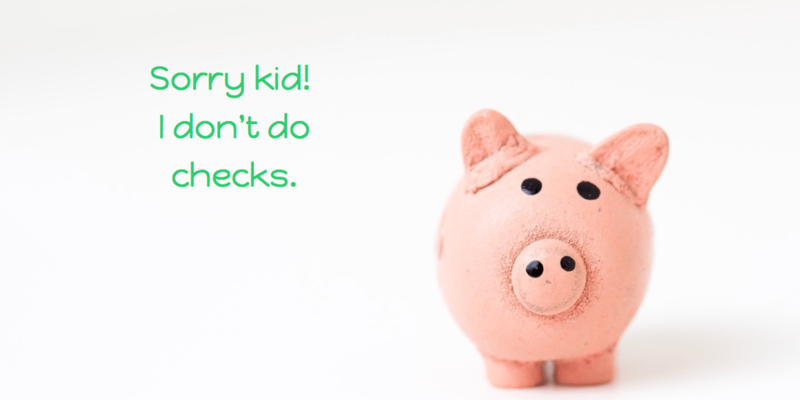 Only after you process the check through your banking account can your child put the cash in a piggy bank. Notice that the piggy bank is standby idly twiddling its hooves waiting for the cash. Grandma still does, as do many other people like me who write checks as gifts because it’s convenient and easier than figuring out another way to give someone money. But those same grandkids who get the checks may never write one as an adult. My granddaughter was fascinated to watch her mother write a check. “What are you doing?” Mom explained how to write out a number in words. However, this a skill my granddaughter may never need. When you are “cashing” a check for your child you can explain the process of converting a paper check into cash, just like a real bank does. Things change. How we transfer money changes. Your children are growing up in a time when money takes many different forms. We now comfortably use e-checks, or electronic checks, to perform the same function as conventional paper checks. We deposit paper checks using smart phones without ever going to the bank. Today if you are using mobile depositing what new technology will your children be using in the future? Set up a system as explained in The No-Cash Allowance. By using a written account-based system (on paper or on a computer) your kids can have hands-on practice managing money they can’t see or touch. Your kids will be learning how to manage money as a number. After all, isn’t this what you are doing? Act as your child’s banker. Direct deposit the amount into their account in writing. Cash the check and deposit in the bank. The next time your child receives a check you can process the check, explain how checks work, and help you child see how a deposit in their No-Cash Allowance account makes their balance get bigger. You are providing hands-on financial education in your own home with a lesson your kids won’t learn anywhere else.